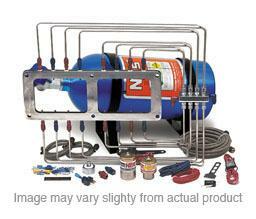 NOS Turbo Nitrous Systems are designed to be the perfect compliment to a factory or aftermarket turbocharged engine. From a standing start and during low or mid-range RPM — before the turbo is at full boost— nitrous will eliminate all “turbo lag,” providing instant torque gains. In addition to adding 30-40% extra HP and torque (depending on the base engine), the nitrous oxide acts as an additional intercooler, as it is injected into the intake at -127°F and as it mixes with incoming air, the intake charge can drop by as much as 75°F. These kits are fully adjustable for various power settings.